I’ve been asking Jade to finish blogging about this dish but she has been really busy with school and with Facebook her after school activities that she just hasn’t had the time and I was too eager to show off her cooking. Can you believe she cooked this up by herself one weeknight when she wanted to save me from having to cook when I got home from work? I think she did an awesome job! She used one of her innovations for this dish, something we’ve got to calling the ‘cooking sauce’. We do a lot of stir fries in our kitchen just because it’s fast and delicious and easy enough for the girls to make on their own. When I’ve cooked stir fries in the past, I just have all my sauces ready and start pouring them into the wok as I stir fry. But Jade, she came up with this idea of putting all the sauces together beforehand then pouring it all at the same time. Now why didn’t I think of that before? 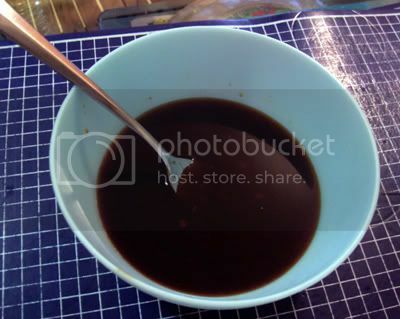 If you’ve ever been to the street food hawkers in Asia, they all have a cooking sauce container that they dip from to flavor their dishes. I’ll try to get the proportions next time because this time around, she said she didn’t measure, just poured a little bit of this and a little bit of that into the combination. 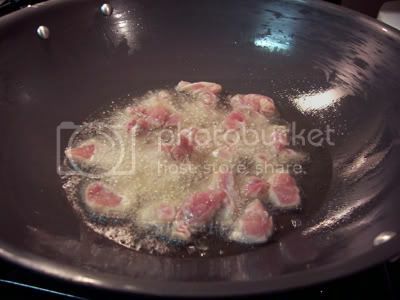 Start by coating the chicken pieces with cornstarch. Heat the oil in a wok and fry chicken in batches and set aside. In the remaining oil (if there is more than a Tablespoon of oil left in the wok, drain some of it off), add the garlic and onions and stir for a minute or two until it is fragrant. Add the chicken pieces back and cook for a minute or two. 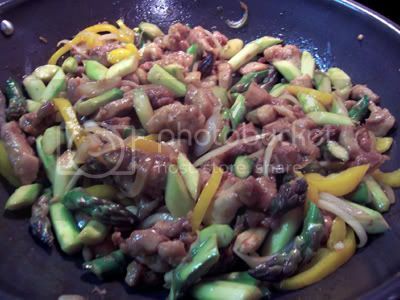 Add the cooking sauce, stir, then add the asparagus and bell peppers. They don’t take long to cook, you really are just warming them up and mixing them into the chicken. We don’t cook them longer than a couple of minutes as we all prefer our vegetables to remain crisp. Adjust your seasonings, and serve immediately over rice. Kudos to Jade for not only knowing how to cook at an early age, but also for being so thoughtful of her mother! hi manana, thank you 🙂 I really am proud of her. She really knows her way around the kitchen now. That’s a start for your son to be able to make fried rice. My other daughter, Asi, only likes to cook dessert. And weirdly enough, she likes to cut up chicken. lol! I’m hoping maybe she’ll become a surgeon. … and smelled wonderful. Wish I could put out a plate for everyone to sample. I’m so proud of her. Last night she used the same technique, with beef and broccoli. yumm! hi Julie, yes I do believe in empowering our kids to be self-sufficient. It pains me when I see kids/teens/young adults who can’t do anything without mommy. Hi Daria, thanks. She is getting to be quite a good cook. I think I forgot to teach her how to clean the kitchen though LOL! hi Weng, that’s a great start. My girls grew up in the kitchen. They used to play drums on the pots and pans while I cooked. Then they wanted getting their hands on what I’m cooking like Abby is doing now 🙂 So yeah, that’s a good sign. She’ll be cooking for you soon!